UR Medicine’s Golisano Children’s Hospital has been designated an official Leukodystrophy Care Network Center by the Hunter’s Hope Foundation. Hunter’s Hope Foundation co-founders Jim and Jill Kelly announced the designation on Monday, making Rochester just the seventh Leukodystrophy Care Network Center in the nation and the first in New York State. Led by Robert Thompson-Stone, M.D., assistant professor of Pediatrics and Child Neurology, the UR LCC will work across disciplines to provide the best care to patients and families. Thompson-Stone and others will also participate in regular meetings with fellow Leukodystrophy Care Network clinicians throughout the United States, allowing providers to share best care practices and discuss new and ongoing research into leukodystrophies. One in 7,000 children are born with a leukodystrophy, a group of rare, progressive genetic diseases that affect the brain and spinal cord. Jim and Jill Kelly’s son, Hunter, was diagnosed in 1997. The University of Rochester Medical Center (URMC) has been selected as one of the first four institutions in the U.S. to participate in the SMA Care Center Network. The network is being created as new treatments and approaches to care are transforming how spinal muscular atrophy (SMA) is treated. The University of Rochester has been selected as a Morris K. Udall Center of Excellence in Parkinson's Disease Research by the National Institute of Neurological Disorders and Stroke (NINDS). The new $9.2 million award brings together researchers from industry and multiple academic institutions to focus on the development of digital tools to enhance understanding of the disease, engage broad populations in research, and accelerate the development of new treatments for Parkinson’s disease. The Department of Neurology would like to welcome residency applicants, interviewing on Monday, January 14th. A wine and cheese reception for the applicants will be held from 4:00 - 4:30 PM in the Garvey Room. All Faculty & Residents are invited to attend. The University of Rochester movements disorders division has been designated as a lead body disorder Association research center of excellence. This designation is obtained at the understanding of the disorder, educating patients and caregivers, and investigating possible research activities specifically aimed at this difficult disease. While many people are always involved in obtaining such a designation, special kudos go to Dr. Katie Amodeo who has been instrumental in our success with this endeavor and will continue to play a key role in developing a successful UR program focused on the rapidly growing field of neurodegenerative diseases characterized by Parkinsonism and Dementia. Research appearing in the New England Journal of Medicine could herald a new treatment approach for individuals with multiple sclerosis (MS) if confirmed in future studies. The results of a clinical trial, which involved researchers from the University of Rochester Medical Center (URMC), showed that the drug ibudilast slowed the brain shrinkage associated with progressive forms of the disease. MS is a neurological disorder in which the body’s own immune system attacks myelin, the fatty tissue that insulates the nerve fibers in the brain and spinal cord. These attacks are caused by inflammation which damages myelin, disrupting communication between nerve cells and leading to cognitive impairment, muscle weakness, and problems with movement, balance, sensation, and vision. MS usually presents with a relapsing-remitting course, in which symptoms occur then disappear for weeks or months and then may reappear, or primary and secondary progressive courses, which are marked by a gradual decline in function. A new practice guideline update for the diagnosis and ongoing medical and rehabilitative care of individuals in a vegetative or minimally conscious state has a result of a brain injury have been published by the American Academy of Neurology, the American Congress of Rehabilitation Medicine, and the National Institute on Disability, Independent Living, and Rehabilitation Research. URMC neurologist Richard Barbano, M.D., Ph.D., was part of a team of physicians and researchers who prepared the new guideline, which appears in the journal Neurology. The experts carefully reviewed all of the available scientific studies on diagnosing, predicting health outcomes, and caring for people with disorder of consciousness, focusing on evidence for people with prolonged disorders of consciousness – those cases lasting 28 days or longer. The guideline recommends that a clinician trained in the management of disorder of consciousness, such as a neurologist or brain injury rehabilitation specialists, should do a careful evaluation and the evaluation should be repeated several times early in recovery. The outcomes for patients with prolonged disorder of consciousness differ greatly. It is estimated that one in five people with severe brain injury from trauma will recover to the point where they can live at home and care for themselves without assistance. There is moderate evidence that patients with a brain injury from trauma will fare better in terms of recovery than a person with a brain injury from another cause. Very few treatments for disorder of consciousness have been carefully studied. However, moderate evidence shows that the drug amantadine can hasten recovery in patients with disorder of consciousness after a traumatic brain injury when used within one to four months after the injury. National Institute of Neurological Disorders and Stroke (NINDS) has extended the University of Rochester Medical Center’s (URMC) membership in the Network for Excellence in Neuroscience Clinical Trials, or NeuroNEXT, which was created to accelerate clinical research involving new treatments for neurological disorders. The $1.5 million grant will provide patients in the region access to cutting-edge experimental therapies and continue the Medical Center’s key role in helping bring new drugs to market. Over the last five years, URMC has been involved in NeuroNEXT studies involving the testing of new drugs for myasthenia gravis, multiple sclerosis, Huntington’s disease, stroke, brain cancer, and neuropathy. “We could not have accomplished this without the phenomenal talent and dedication of our faculty, study coordinators, and research teams.” said Erika Augustine, M.D., M.S., co-Investigator on the grant. In addition to URMC’s role as a NeuroNEXT site, the Medical Center has two additional key roles supporting the national network. 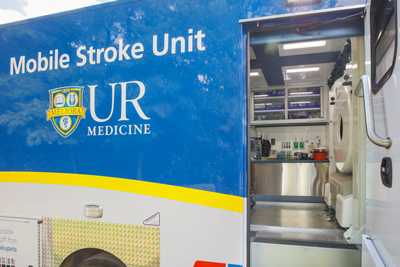 The URMC Clinical Materials Services Unit – part of CHeT – provides logistical support and drug supply distribution services for NeuroNEXT clinical trials and UR Labs provides central laboratory services for the network. We are pleased to announce the formation of a combined pediatric and adult Neurofibromatosis clinic. This clinic will be held every four months, and will offer families the ability to be seen on the same day by clinicians expert in neurofibromatosis (NF). Our clinic is headed by Dr. Alex Paciorkowski, who is trained in both Neurology and Genetics. He has a particular interest in neuro-developmental disorders, and is an excellent resource particularly with challenging genetics cases. Dr. Marina Connolly, a child neurologist with special interest and expertise in pain, and headaches, which are common to our patients, will see pediatric NF patients. Dr. Joy Burke is the adult neuro-oncologist who will be joining us, with expertise in treating tumors of the nervous system including brain, spine, and nerves. Patients with neurofibromatosis may be affected by these problems, and may also have other neurological problems such as migraines, nerve pain, or cognitive function issues which Dr. Burke can address. Dr. Bo Lee, our neuro-genetics fellow will also be involved in patient care, learning about this complex but relatively common neurologic disease. Carolyn Dickinson is the pediatric nurse practitioner on the team, and has been working with children with neurofibromatosis for many years. Finally, Kelly Minks, CGC MS, is our genetic counselor, and assists our team with genetic testing issues. As neurofibromatosis may affect various organ systems a multidisciplinary clinic allows patients to coordinate appointments with various other specialties, and minimize travel. This combined clinic will also allow our specialists to discuss cases, ease the transition for adolescent and young adults, and facilitate research efforts. The University of Rochester Medical Center is currently looking for people with Cryptogenic Sensory Peripheral Neuropathy for a research study conducted by the Network for Excellence in Neuroscience Clinical Trials (NeuroNEXT). The purpose of the research study is to learn if the drug topiramate slows the progression of Cryptogenic Sensory Peripheral Neuropathy (CSPN), also known as “idiopathic neuropathy” or neuropathy of an unknown cause, and improves quality of life. As part of this study, we will use a number of assessments and questionnaires to determine if topiramate improves symptoms of CSPN. There is a one in two (or 50%) chance of receiving the study drug or placebo pill. Participants must be between 18-75 years of age to be in the study, have a diagnosis of CSPN or idiopathic neuropathy, have signs of metabolic disease including abdominal obesity, pre-diabetes, high blood pressure or abnormal cholesterol/lipids, and no history of prior therapy with topiramate. This study is actively enrolling participants. To learn more information, please visit ClinicalTrials.gov, identifier number: NCT02878798. If you are interested in participating, contact Janet Sowden at the University of Rochester Medical Center by phone at (585) 275-1267 or email at janet_sowden@urmc.rochester.edu. In this role, Nimish will work with me to lead our efforts to support faculty and residents in developing their careers and enhancing their contributions to the department, the medical center and the field of neurology. To achieve these goals, Nimish will collaborate with the Associate Chairs of the Department and various Associate Deans of the Medical School [Faculty Development (Janine Shapiro), Academic Affairs (Jeff Lyness) and Inclusion and Diversity (Linda Chaudron)]. As a Department, we seek to provide an open, warm and nurturing environment to enable and support our amazing faculty, residents and staff every day. Nimish has bold initiatives to create supportive structures for career growth and promotion, in addition to leading the Department’s diversity initiatives. He will also participate as a member of the Department’s Promotion and Tenure Committee. Nimish joined the Department in 2007, after completing his neurology training at Northwestern University (2004) and his neuro-oncology training at Memorial Sloan-Kettering (2007). Nimish has created a vibrant, inclusive and forward thinking Division of Neuro-oncology, which excels in all of its missions. The clinical program now sees more than 100 brain tumor patients each year, he has been the PI for over 20 brain tumor clinical trials, and he Director for the UCNS Neuro-Oncology Fellowship and the Neurology Resident Mentoring Program. The program is simply flourishing under his leadership. While he will continue to lead the Neuro-Oncology Division, he is setting his sights higher however, as he takes on new leadership roles within the Department and nationally through the American Academy of Neurology. Please join us in congratulating Nimish! Wilmot’s competitive seed-grant program aims to fund research projects that will generate preliminary data necessary to potentially apply for federal funding in the future. Thanks to financial support from two community organizations – Adding Candles for a Cure and the Edelman Gardner Cancer Research Foundation – four projects have received funding that started Jan. 1. Mark Noble, Ph.D., Professor in the departments of Biomedical Genetics and Neuroscience, received a $50,000 grant for his project titled, “A biomarker for a novel glioblastoma (GBM) vulnerability.” The co-investigators for this project are Kevin Walter, M.D., Mahlon Johnson, M.D., Ph.D., Nimish Mohile, M.D., and Peggy Auinger, M.S. Bradford Mahon, Ph.D., Assistant Professor in the Departments of Neurology and Neurosurgery, received a $50,000 grant for his project seeking to demonstrate feasibility and preliminary efficacy of advanced MRI mapping in improving outcome in patients with glioblastoma. Kevin Walter, M.D., is the co-investigator for this project. Congratulations to all Wilmot pilot grant recipients. Dr. Sahin has been an Assistant Professor of Neurology at the University of Rochester’s School of Medicine and Dentistry since 2013. He earned his undergraduate degree in molecular biology at Princeton University and his M.D. and Ph.D. in Neuroscience at the University of Texas Southwestern Medical Center. 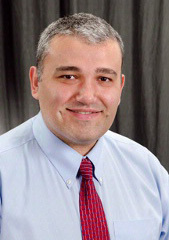 Dr. Sahin completed his residency in neurology and fellowship in vascular neurology at Johns Hopkins University. In 2015, he became the Director of the Vascular Neurology Fellowship Program at the University of Rochester Medical Center and has transformed the fellowship. In 2017, there were 76 Vascular Neurology Fellowship Programs across the United States and only 36 of them were filled. Under Dr. Sahin’s leadership, the University of Rochester’s program has filled for three consecutive years and counting. “Dr. Sahin is an outstanding clinical neurologist and a passionate educator. 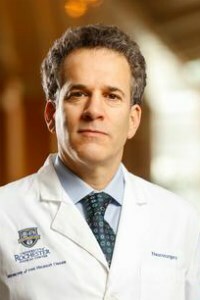 We look forward to Dr. Sahin bringing the same positive leadership approach to Highland that he’s brought to the Vascular Neurology Fellowship Program as we continue to integrate and expand our acute care service,” said Robert G. Holloway Jr., M.D., M.P.H., Professor and Chair of the Department of Neurology at the University of Rochester Medical Center. “Highland Hospital is a New York State Designated Primary Stroke Center and an integral part of our stroke care network in UR Medicine. As a board-certified Vascular Neurologist, Dr. Sahin will also serve as the Stroke Center Director, ensuring Highland Hospital maintains its vital role in providing excellent stroke care to our community,” said Curtis Benesch, M.D., M.P.H., Professor of Neurology and Neurosurgery and Medical Director, URMC Comprehensive Stroke Center. Dr. Sahin follows Adam Kelly, M.D., who served as Highland Hospital’s Chief of Neurology for almost six years. The University of Rochester Medical Center (URMC) has been selected to participate in a national network created to develop new ways to diagnose and treat Lewy Body Dementia (LBD). The new initiative, which is being organized by the Lewy Body Dementia Association, will seek to raise awareness and advance research for this complex disorder. LBD is a progressive brain disorder marked by abnormal protein deposits – called Lewy Bodies – in areas of the brain important for behavior, cognition, and motor control. This complex disease gives rise to a range of symptoms, including cognitive impairment, sleep disturbances, hallucinations, difficulty with blood pressure regulation, and problems with movement and balance. Individuals with the disease will often experience marked fluctuations in their levels of alertness and clarity of thought. The University of Rochester Medical Center (URMC) is helping lead two advocacy efforts to increase awareness of the value of telehealth for individuals with Parkinson’s. These activities coincide with World Parkinson’s Disease Day on April 11. CHeT is working with the Parkinson’s Foundation to advocate for telehealth by encouraging all of the Foundation’s 18 Centers of Excellence to provide at least one telemedicine visit on April 11. Dorsey has undertaken several studies over the last decade to demonstrate the feasibility and effectiveness of connecting Parkinson’s patients with specialists using telemedicine. Results of a recent study funded by the Patient-Centered Outcomes Research Institute demonstrated that telemedicine can successfully deliver quality care. In addition, CHeT has partnered with Burn Along – an online video fitness and wellness platform that offers hundreds of classes at all fitness levels – in inviting individuals with Parkinson’s disease, caregivers, family members, and advocates to participate in free classes to raise awareness of the importance of exercising for Parkinson disease. Studies have shown that exercise can help keep the symptoms of Parkinson’s at bay and may even slow the progression of the disease. Burn Along has joined with Dance for PD – a Brooklyn-based company that has created dance classes for people with Parkinson’s – to produce videos for distribution on their website. Individuals who sign up for the free classes with Burn Along on April 11 will have access to all of the site’s video content for the entire month of April. A new study out today in the journal JAMA Neurology shows that smartphone software and technology can accurately track the severity of the symptoms of Parkinson’s disease. The findings could provide researchers and clinicians with a new tool to both develop new drugs and better treat this challenging disease. “This study demonstrates that we can create both an objective measure of the progression of Parkinson’s and one that provides a richer picture of the daily lived experience of the disease,” said University of Rochester Medical Center (URMC) neurologist Ray Dorsey, M.D., a co-author of the study. One of the difficulties in managing Parkinson’s is that symptoms of the disease can fluctuate widely on a daily basis. This makes the process of tracking the progression of the disease and adjusting treatment a challenge for physicians who may only get a snapshot of a patient’s condition once every several months when they visit the clinic. This variation also limits the insight that researchers can gather on the effectiveness of experimental treatments. The new study, which was led by Suchi Saria, Ph.D., an assistant professor of Computer Science at Johns Hopkins University, harnesses the capabilities of technology that already resides in most of our pockets all day, every day. Researchers recruited 129 individuals who remotely completed a series of tasks on a smartphone application. The Android app called HopkinsPD, which was originally developed by Max Little, Ph.D., an associate professor of Mathematics at Aston University in the U.K., consists of a series of tasks which measure voice fluctuations, the speed of finger tapping, walking speed, and balance. The Android app is a predecessor to the mPower iPhone app which was developed by Little, Dorsey, and Sage Bionetworks and has been download more than 15,000 times from Apple’s App Store since its introduction in 2015. As a part of the study, the researchers also conducted in-person visits with 50 individuals with Parkinson’s disease and controls in the clinic at URMC. Participants were asked to complete the tasks on the app and were also seen by a neurologist and scored using a standard clinical evaluation tool for the disease. This aspect of the study was overseen by URMC’s Center for Health + Technology. John Markman, M.D., professor of Neurosurgery and Neurology, was elected to the board of the American Pain Society in March of 2018. The American Pain Society is the nation’s leading organization of scientists, physicians, and allied professionals focused on increasing knowledge of pain and transforming clinical practice and policy to reduce pain-related suffering. Markman founded and directs the University’s Neuromedicine Pain Management Center and Translational Pain Research Program. Together these programs were previously recognized as a Center of Excellence by the American Pain Society.